The bourse performed well on a slow news day today, as banks and miners lead the index higher. Banks, in particular the regionals in Bendigo and Bank of QLD, were shown a bit of respite from investors with the big four also finishing higher. ANZ announced a range of impacts to their half year results due out next week, pre-releasing the impacts of some known large items including the sale of their wealth business and restructuring charges that will be absorbed in the result. ANZ finished nearly 1% higher, with the announcement better than what the market was expecting, which also helped the other banks find some investor support ahead of their interim results. Miners were also surprisingly strong despite weak commodity prices on Friday evening. Growth stocks were the losers today as the treasury yields edged higher, and tech stocks were weaker following the selloff in the US lead by Apple as Chinese sales expectations deteriorated. A number of companies announced some management changes today, with iSelect losing their CEO (more on this later), Myer closed 8.5% higher on the back of the appointment of John King to CE, and the embattled asset manager Blue Sky saw the departure of their MD Robert Shand and fell 10.4% on the news. Overall the index added 17pts to 5886, up 0.29% on the day. 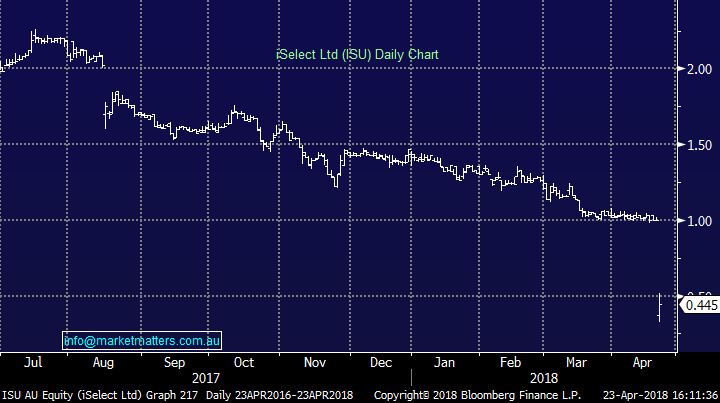 iSelect (ISU) $0.445 / -55.5%; a difficult 12-months for the comparison platform hit another hurdle today following the resignation of MD & CEO Scott Wilson and downgrading EBIT guidance ~70% to $8-$12mil blaming a fall in lead generation and higher acquisition costs across all offerings. Doubts about iSelect’s ability to meet guidance have been noted since the half year result in February, which was much weaker than expected. Commentary from the company at the time was looking for a large second half skew in revenue which has since been derailed. The immediate resignation of Wilson also rubbed salt into the wounds of investors, a sign that all is not well within the company. Now down 80% from 12-month highs, ISU has been sick for some time. Newcrest Mining (NCM) $20.55 / +2.8%; finally some good news from the gold miner, announcing that approval has been received to use the old Cadia Hill open pit mine as a tailings dam after a dam wall collapsed back in early March. Although production had recommenced at the site using the southern dam, the approval now significantly increases tailing deposit capacity and will allow operations to ramp up again. While other gold miners were weak today, NCM pushed strongly higher on the news.